In a previous life, I was a technical writer. This means that I spent all day writing and editing manuals and documentation. Running a tea company is a completely different kind of career, but I learned a lot in my former job that translates to any kind of business. I wanted to share some of this with you as presenting yourself and your business in the best way possible includes thoroughly checking your content for errors. Spelling and grammar are an important part of getting and maintaining customers. It starts with their first impression of you and your product or service. The BBC covered a study by an online entrepreneur that showed that a website’s revenue per visitor was twice as high after a small spelling error was corrected on the front page. A 50% increase in sales is nothing to sneeze at! Besides sales, there are a lot of other reasons why it is necessary to have correct spelling and grammar on your website and any other printed materials, if you want your business to succeed. They may not be as easy to measure as a direct increase in sales, but that doesn’t mean they aren’t important! 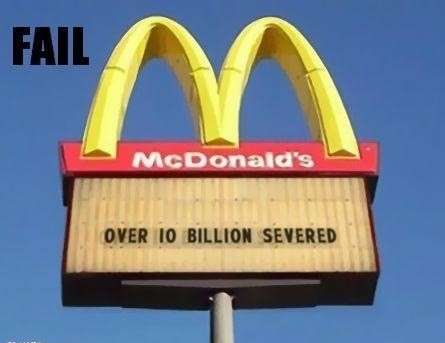 Whether this is legitimate or a prank, it is a great example of how a spelling mistake could kill your business (and your appetite). You don’t want your emails to look like spam. Have you ever opened up an email and known right away that it is phishing or spam? These messages are rarely written by people with a solid grasp of the English language, and typos are part of what gives away the con. You do not want to give your customers the impression that you are spamming them or sending them a phishing email. Even small mistakes can cost money. If you regularly print marketing materials and notice a spelling mistake after you have sent these items to print, you would need to throw them out and start again. That’s expensive, and no small business owner has that kind of wiggle room in their budget. Your website’s search results and SEO could be suffering. Misspelling what you are selling could mean that your website is not showing up in search results – either through a search engine, Etsy, or your own website’s search feature. This could lead to no one finding you, or your customers not being able to find what they are looking for. No one expects you to get it right every time, and even if you write for a living, you’re still going to make mistakes. Thankfully, correcting spelling and grammar mistakes is pretty easy. Many email and publishing tools include a spell checker, so make sure you don’t ignore those red squiggles when they appear. 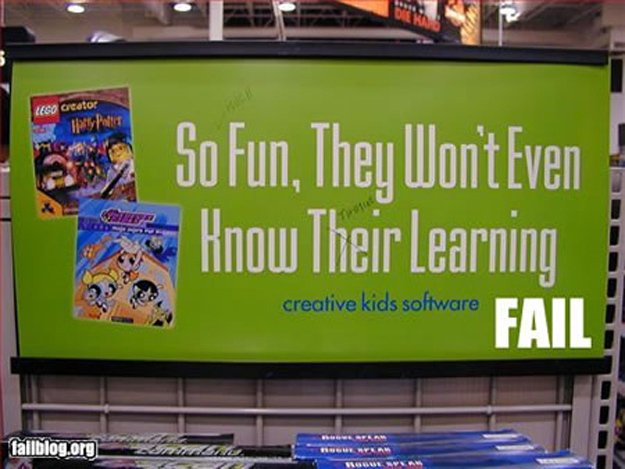 Spelling mistakes in your advertising can be expensive, especially if what you are advertising (educational products) is related to the mistake you made (which shows a lack of education). You’ll lose customers for sure. You may also become an Internet joke. Read each sentence individually, out loud if possible. Don’t compare how it sounds to the sentences around it – how does it read on its own? Are the words in the right order? Are you using the correct words? For example, your spell checker may not notice if you say you are selling hare ties when really you are selling hair ties. Know the difference between regularly misspelled or misused words, like your and you’re or their and there. Misusing these in marketing material makes you look lazy (sorry, but it’s true – you can Google the difference to ensure you’re using the right one). Enlist another pair of eyes. Ask a friend or your partner to look over your copy for you. When you have been working on something for a long time, it is easy to overlook small mistakes. Part of what makes good writers good is how well they utilize their editor – no one is perfect, even those that consider themselves the self-appointed “grammar police”. Proper punctuation means your message will be understood correctly. This is an example of accidentally saying something completely different! Use clear, concise language to explain your product and why it should appeal to your customers. Pretend you are using Twitter – how can you cut a sentence down to get to the point even faster? Avoid using text speak or abbreviations though, as your customer may not be familiar with them. 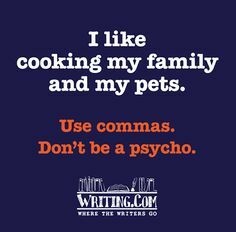 Use things like commas, apostrophes, and quotation marks correctly. Quotation marks, like in the picture below, are often incorrectly used for emphasis. Think about your personal and business reputation. Would you buy from a store that didn’t seem to care that they have three different mistakes in a single paragraph? What does that say about their attention to detail? Keep this thought in mind when you are preparing new content – as a small business owner, you are not only selling your product or service, you are also selling yourself (er…not like that). 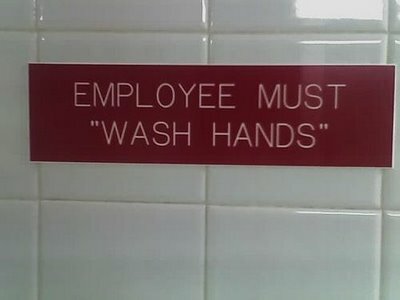 Please, please don’t ever use quotation marks for emphasis. Use bold or italic text if you must. This use of quotation marks makes me want to eat elsewhere. Just because you are a small business does not mean that you should be presenting yourself in an amateur way. Nothing says you don’t care about your professional image more than spelling and grammatical mistakes! You can help yourself get and retain customers and present your business in a more polished manner by catching mistakes before you publish or print your content. PS: If you need a second pair of eyes or have a question, I am always happy to help out other girl bosses. Send me an email. Samantha Cross owns Tearrific Inc. and a loose leaf tea food trailer called The Tea Wagon. She has a BA in English and Film and an MA in Writing for the Media. When she’s not creating new tea blends or out with the trailer, she loves reading, writing, and editing (usually with a cup of tea in hand).